"I have come to believe that the barriers of culture and social class are even more difficult than the barrier of race." I'm glad that he recognizes this fact, acknowledges it, and articulates it. Jesus also talked a lot about class when He was on earth. Jesus was continually concerned about the poor and He mocked the high and mighty. Jesus continually reminded us that we are all the children of God, Abba. Jesus was a Universalist. He also was a Unitarian. 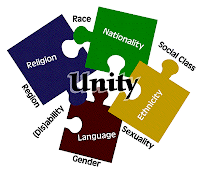 It is not than race, gender, sexual orientation, age, ability, religious affiliation are not significant criteria for us, as humans, to use to discriminate in an exclusionary way, but class is by far more important especially in the UU world. It would do us well to study our classist attitudes as much, if not more, than our racist attitudes. Thanks to Rev. Peter Morales for pointing this out. You can read the whole brief article by clicking here. Yes, Jesus was a Jew, Jeremy. Just change David's capitals to lower case U's. As a Jew, Jesus was unitarian in belief: every day of his life he recited the Shema: Hear, O Israel, the Lord our God, the Lord is One. That is a small-u unitarian statement of faith. And as a particular kind of Jew, he preached the good news to everyone, including those left out of the normal socially and ritually acceptable schema of Jewish life. His followers hadn't yet created their version of what salvation meant. But his practice of inclusion can be described with the word "universalist." And, as a Jew, he understood salvation to be a communal rather than an individual thing. The "universe" is saved or lost together. How do you know what he did 'every day of his life'? Some believe Jesus was a Buddhist. Fair enough, Jeremy. I don't even know that a real flesh-and-blood Jesus Christ ever lived. Or if he did that anything about him stated in or inferred from the canonical Gospels is true. No one knows.